This is an adjustable spreader beam that provide a versatile solution for handling many different sized loads, ideal for outdoor applications. This beam is a convenient end fitting design that allows us to build a custom size four-point spreader beam with a QUICK SHIP delivery schedule. Capacities up to 9 tons and spreads up to 12’ x 12’. A. Lower lifting hooks - specify fixed or swivel. D. Wire rope load slings. Note: Some rigging options could increase delivery time. New knock-down design is easily transported. 6 or 9 ton capacity. Spreads up to 12' x 12'. Chain top rigging and hoist rings. Lower lifting shackles standard - see other options below. Fixed length/width spreader design in rigid or bolt together style. Specify style required. Telescopic length/width spreader design to handle loads of varying sizes. Specify min./max. lengths required for spreader length and/or width. Fixed length 4-leg wire rope or chain sling. 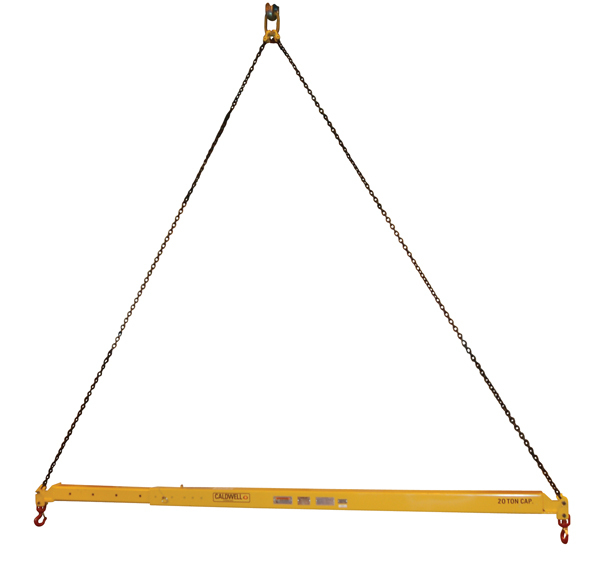 4 point Adjust-A-Leg®load leveling sling for unbalanced loads. Top or bottom container lifting lugs with wire rope slings. Chain slings with hook attachments. Boat lifting belly slings for marine applications. The same end fittings that build our high capacity spreader beams are available as end fittings only. This allows you to stock one or several sizes of end fittings; work with a local steel supplier to provide cut to length schedule 80 pipe; drill accordingly and add the required top rigging. Now you can respond to your customers needs with a quickly built, ASME compliant spreader beam. 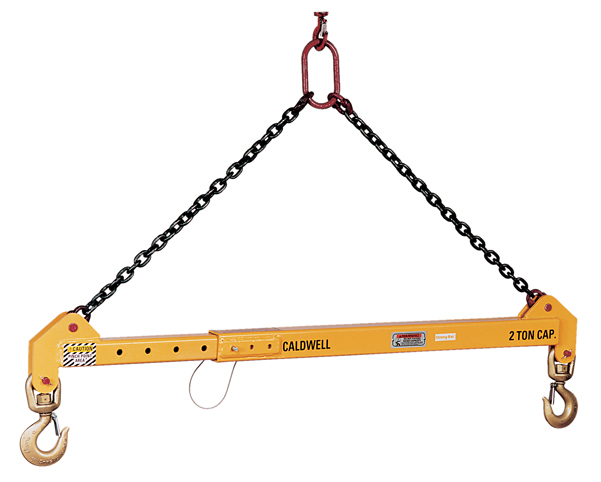 Caldwell's new High Capacity Spreader Beam is the solution you need to fill those orders where aquick delivery is required on beams with capacities ranging from 5 to 130 tons. Capacity and spread configurations are virtually limitless. The chart below highlights sizes available from 50 to 130 tons. You can review our complete high capacity spreader beam chart, starting at 5 tons, online at www.caldwellinc.com. For beam customizations, please fill out an application evaluationform online or contact us with complete details and we will configure the high capacity spreader beam you need! Unique pivoting lower lugs allow for 75° to 90° lower rigging angle. Capacities from 5 to 130 tons. Beam only available in 7 - 10 days. Optional wire rope top rigging available.